The wide angle lens and macro lens are attached together upon arrival. When you use the wide angle lens, please DO not detach the wide angle lens from the macro lens. When you use the macro lens, please detach the wide angle lens from the macro lens. 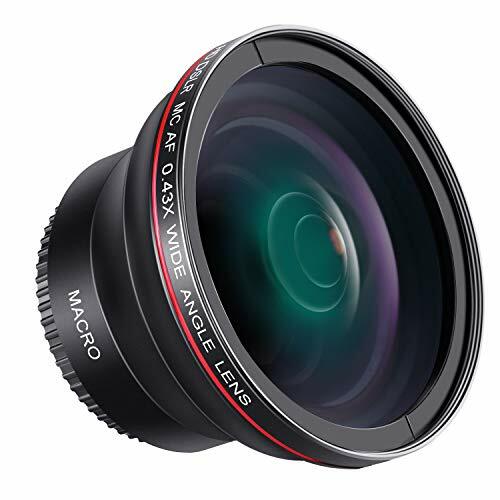 This conversion lens is compatible with 58MM lenses only. Please verify your camera's lens thread size before ordering. Your camera's lens thread size is marked with a "Φ" (diameter) symbol. For example: Φ58 = 58MM lens thread size.Camera lens is not included. Compatible with Canon Rebel (T5i T4i T3i T3 T2i T1i XT XTi XSi SL1), Canon EOS (700D 650D 600D 550D 500D 450D 400D 350D 300D 1100D 1000D 100D 60D) with 58MM Lens: EF-S 18-55mm f/3.5-5.6 IS II , EF-S 55-250mm f/4-5.6 IS II , EF 50mm f/1.4 USM , EF 75-300mm f/4-5.6 III USM. Wide angle lens can provide maximum light and image transmission with maximize day and night shots and add the power of your camera's zoom. The included filters are made of HD optical glass for high definition optical resolution, which can minimize reflections and lens flare. Lens Compatibility: Popular 58MM Lens model includes EF-S 18-55mm f/3.5-5.6 IS II, EF-S 55-250mm f/4-5.6 IS II, EF 50mm f/1.4 USM, EF 75-300mm f/4-5.6 III USM. NOTE: PLEASE VERIFY YOUR CAMERA'S LENS THREAD SIZE BEFORE ORDERING. This Wide-Angle is compatible with 58MM lenses only. Lens sizes vary regardless of camera brand or model. Your camera's lens thread size will be marked somewhere on the lens barrel or printed underneath your lens cap. This number is always preceded by a ""Ø"" (diameter) symbol. For example: Ø58 = 58mm lens thread size.